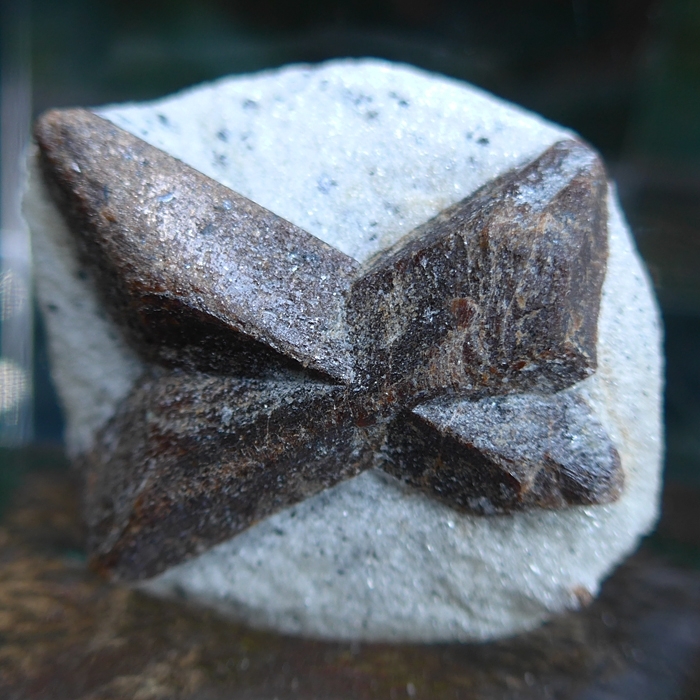 Dimensions (HxWxD): 2" x .875" x 0.85"
This beautiful Double St. Andrew's Staurolite Cross is a complex crystal formation from Keivy, a city in the Kola Peninsula of far Northern Russia. The umber and siena colored staurolite appears embedded in a whitish matrix of muscovite, mica and schist, which creates a myriad of tiny sparkling inclusions. This unique specimen has a St. Andrew's cross on both sides, front and back, as you can see in the pictures on this page. True Staurolite like this specimen easily scratches glass. 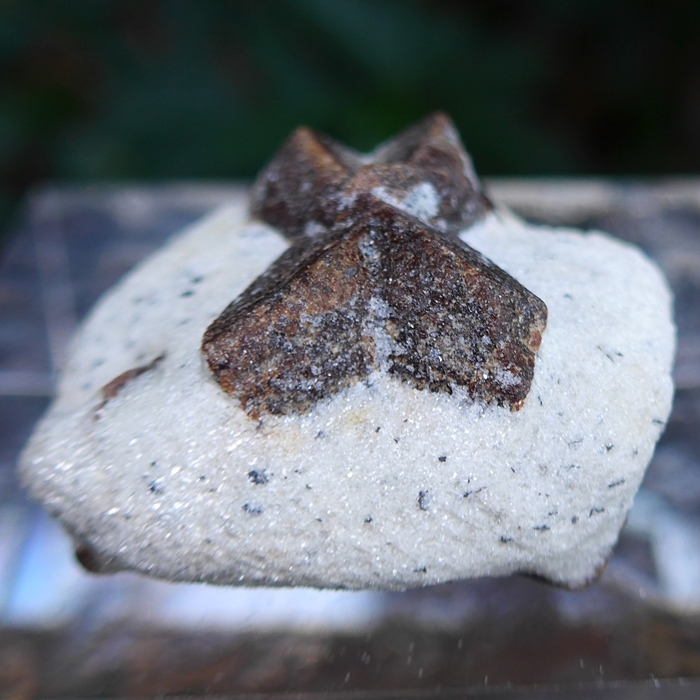 Staurolite is an extremely hard, insoluble mineral formed from iron magnesium aluminum silicate, naturally occurring as reddish-brown orthorhombic crystals embedded in a matrix of metamorphic rockshigh in iron and aluminium. The high hematite content gives Staurolite crystals their characteristic reddish brown color, and indicates an energetic affinity with Archangel Michael. 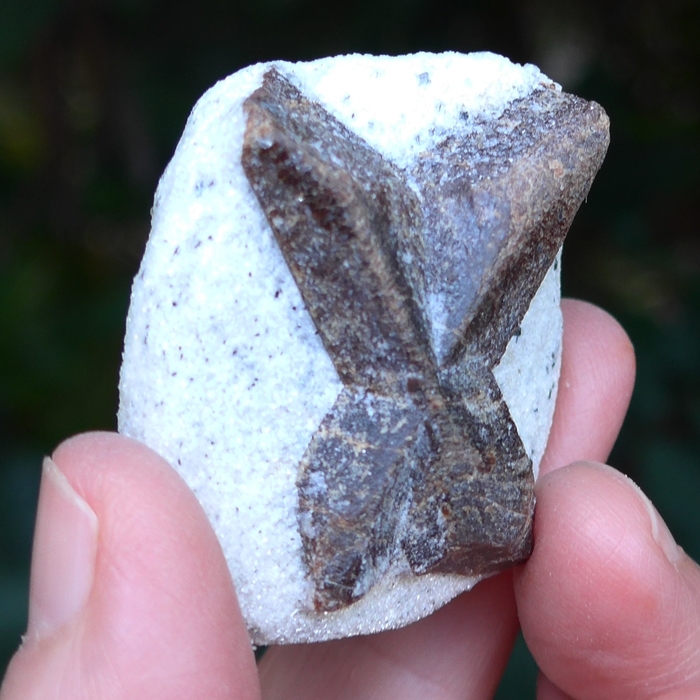 The name is appropriate because Staurolite crystals often appear in twin cruciform formations, in the shape of a Greek cross, with a 90 degree angle between the arms, or in the shape of a St. Andrew’s cross, with a 60 degree angle between the arms. 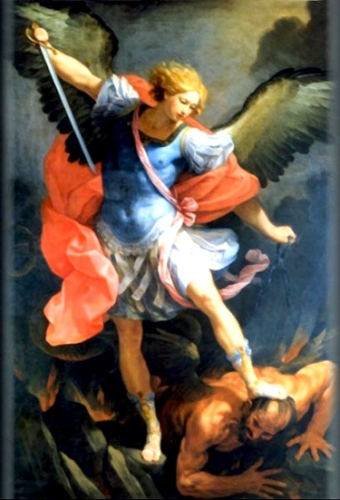 A saltire, Saint Andrew's Cross, or crux decussata is a heraldic symbol in the geometrical form of the diagonal cross upon which St. Andrew was said to be crucified. 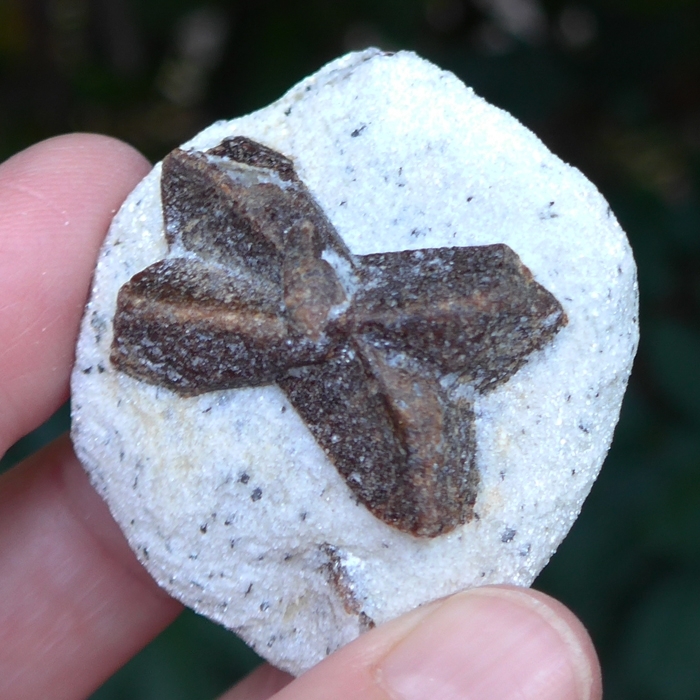 Staurolite cruciform twins have been worn by religious devotees through the ages, and are renowned as sacred natural objects, invested with the power to heal, bring good luck and transform the soul. Note: Weight above is shipping weight. Net weight is 1.9 oz. or 53 grams.